From the 1950s heyday of Lucy and Ethel to the return of Doll and Em this Sunday, funny ladies have been hitting screens in pairs for decades. 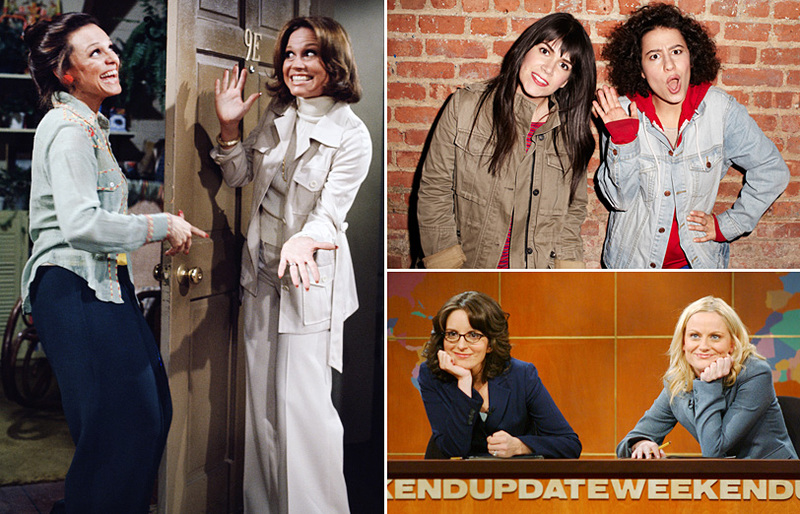 Here, 12 of television’s top lady-duos who always make us laugh. The original TV twosome, Lucy and Ethel (Vance) were so close and quirky they even had their own friendship song. Ethel was technically Lucy's landlord, but you'd never know it based on how close they were. These ladies started bringing the laughs in 1970 with The Mary Tyler Moore Show and carried on to its spin-off, Rhoda. We still haven’t been able to forget their bond. "1, 2, 3, 4, 5, 6, 7, 8 Schlemiel! Schlimazel! Hasenpfeffer Incorporated!" The Happy Days spin-off lasted for eight seasons from 1976-1983 with tomboy Laverne De Fazio (Marshall) and the bubbly Shirley Feeney (Williams) as roommates and bottlecappers at Shotz Brewery. In their Sweeney Sisters sketches, they played lounge singers Candy (Hooks) and Liz (Dunn), covering pop hits with high-pitched, off-key sopranos alongside Nick the Lounge Singer (played by Bill Murray) that almost always began with “The Trolley Song.” Their rendition of "Bridge Over Troubled Water" is particularly brilliant. Where they lead, we will follow! The banter between mother-daughter duo Lorelai (Graham) and Rory (Bledel) about life, love and favorite films was some of the fastest, funniest and smartest on television. And when you threw in matriarch Emily (Kelly Bishop), it only got better. Liz (Fey) and Jenna’s (Krakowski) friendship on the fictitious set of TGS was based mostly on Liz building up Jenna’s self-esteem – but occasionally it would go both ways. These working women may not have always had each other’s backs, but they had our funny bones. These New York City stand-up comedians star in Comedy Central’s breakout hit Broad City about reckless friends living in the Big Apple. The show, based off of their web series of the same name, premiered in January 2014. The two met through the Upright Citizens Brigade Theatre, and have been creating crazy comedy since. These two ladies have known each other since childhood (around ages four or five), and their close bond translates onto television. Their HBO show Doll & Em about an actress and her best friend/personal assistant premiered in 2014, and returns for Season 2 on Sunday, September 13. Karma (Stevens) and Amy’s (Volk) fake on-and-off relationship and real on-and-off friendship makes for some wild moments and solid jokes. The romantic-platonic combo has spurred a ‘ship name for the two: Karmy. Faking It is currently airing Season 2 on MTV. Reunited and it feels so good. Fonda and Tomlin have been buds since their hit film Nine to Five hit theaters 35 years ago. Now, they're cracking jokes together in Netflix's Grace and Frankie, playing former rivals who band together when their husbands both leave them – for each other. Grace and Frankie premiered in May and has been renewed for Season 2. Another Saturday Night Live duo and another nod to Fey, but really, these two are funny in anything they work on together (and should co-host every awards show on TV.) Some SNL highlights for the road, though? Try their Hillary Clinton and Sarah Palin sketches and their stint as Weekend Update anchors.